The Wiregrass Trail, a 70 mile historic highway route through Southeastern Georgia, runs through Tattnall County. This scenic byway (Highway 57), in addition to providing an enjoyable alternative route to Georgia's Golden Isles from Atlanta and Northwest Georgia, also posseses historical, academic and ecological significance. Called the best-kept secret of travelers in Georgia, the Wiregrass Trail is the fastest and most scenic way to get from Macon to The Golden Isles. Beginning at exit 22 on I-16, it passes through exit 11 on I-95 and ends on Highway 17. The Wiregrass Trail will not only shave 42 miles and 30 minutes off the trip, it also allows travelers to take a quiet trip past antique stores and Revolutionary War sites, over glinting rivers and through historic coastal hamlets and family farms. As the route's promoters state in their markering material, "Let your mind unwind as you save a little time. 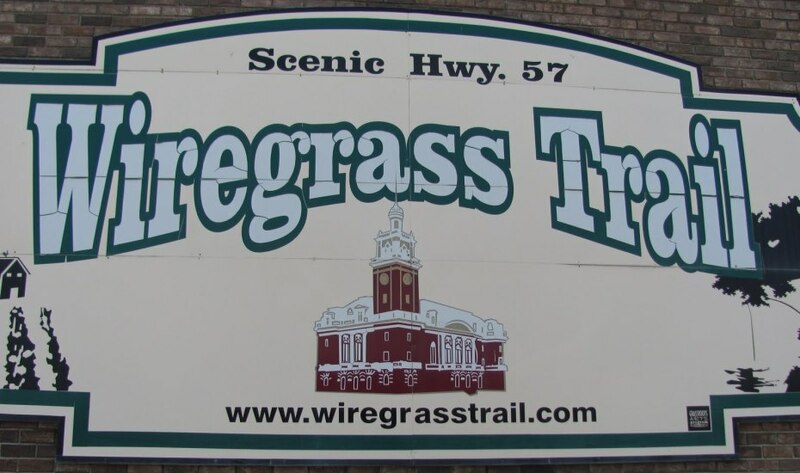 Take the Wiregrass Trail. You'll arrive relaxed, not ragged from the rough ride." Along the Trail, you'll see fertile fields of World Famous Vidalia Sweet Onions and cool orchards of pecans and peaches, all for sale at roadside stands. The kids will spot flocks of wild turkeys and lone deer grazing under moss-bearded oaks. You'll see turn-of-the-century courthouses, classic Main Street architecture, and graceful homes. Historic churches point steeples to smog-free blue skies, and historic markers tell of Revolutionary War forts and Civil War heroes. Signs point to state parks where you can picnic by the lake, let the kids romp, or stretch your legs with a paddle boat ride or a round of golf. You'll glimpse roadside murals that depict life a century ago and fully restored Victorian buildings. You can explore museums, wildlife management areas, or the tabby ruins on the scenic waterfront. Or just keep driving while you enjoy the scenery and yourself on The Wiregrass Trail. COBBTOWN: One of the cleanest small towns in America. People take pride here in many of the turn of the century homes and buildings. On your left, you will see the fully restored Coleman Hotel where one of the original "Lucky Strike" girls resides. You will also find the barter & trading post still doing business and The Cobbtown "Mall" with self & full serve pumps. Right outside you will notice lilypad laden watering holes and large fields of green. Look a little closer and you will see that you are passing through one of the largest producing areas of Vidalia onions in the world! COLLINS: Rich in history, Collins is a town that shares its images of the past in lovely homes and ancient trees. Take a moment to visit the first enclosed gymnasium in the state and handpainted local add billboards before you head south. The town has also just completed a new square in town for you to stop and have refreshments before you move along the tree shaded avenue that takes you through town. REIDSVILLE: Some sites that you won't want to miss include Big Hammock Wildlife Management Area, which runs along the Altamaha River, The Gordonia Altamaha State Park, or The Ohoopee Dunes at the Ohoopee River. Stop by the Alexander Hotel and find out why Reidsville is "Friendship City USA". Now is a good time to check in with some of our fine eateries in town. GLENNVILLE: A must see is the Armstrong Cricket Farm, the largest in the world! Find out how they raise pine seedlings at the Rayonier Regeneration Facility or visit the Glenville-Tattnall Museum. As you drive through, you will note the unique stores, historic homes, and a 75-foot mural depicting life in the early 1900s. You will also appreciate the long stretches of pecan and peach groves just outside of town. When the season is right, plan to stop a moment at one our roadside fruit and vegetable stands or the Farmers Market and pickup some goodies to keep your tummy happy.